We at Geeky Hobbies would like to thank Yanim Studio for the review copy of Red Goddess: Inner World used for this review. Other than receiving a free copy of the game to review, we at Geeky Hobbies received no other compensation for this review. Receiving the review copy for free had no impact on the content of this review or the final score. Despite being a big platformer/action game fan, I have to admit that I have never played any of the classic Metroid or Castlevania games that are an inspiration for the Metroidvania style of games. Metroidvania games are generally characterized by their large interconnected world maps. What makes these games unique is that you need to revisit levels later on in the game once you have obtained a special ability that will allow you to access a new part of the room. While still not hugely popular, Metroidvania games have seen a resurgence due to indie developers. Red Goddess: Inner World is one of these indie Metroidvania titles. The game started life as a Kickstarter game where it found over 1,300 backers and raised over $40,000. While the game is a little on the easy side and the combat could use a little more variety, Red Goddess: Inner World mixes some beautiful visuals with some fun gameplay to create a fun Metroidvania style game. Red Goddess has two main mechanics: platforming and fighting/beat-em up. A lot of the content in the game revolves around the platforming elements within the game. Taking inspiration from games like Metroid you will be journeying back and forth throughout the game world. You will travel to an area of the world and will eventually have to return once you have gained a new ability that lets you open up a new path. This does force some backtracking and the game sometimes feels like a long fetch quest. Since the backtracking never takes that long it is not that big of issue. With all of this traveling back and forth I give the game a lot of credit for making it easy to see where you have to travel in order to get to your next destination. Without the well designed and easy to navigate map, this part of the game could have been a disaster. The platforming in general is quite solid. The game doesn’t really add any platforming mechanics that you haven’t seen in other games. You have your basic jump, double jump, glide, and teleport abilities which you will need in order to overcome the obstacles in your way. The controls are simple to understand and for the most part are precise and work well. For a majority of the game I would probably classify the platforming elements of the game to be on the easier side of the spectrum. What you have to do at any specific time is usually pretty straight forward. There is really no puzzle solving in the game where you have to work out how to proceed in the game. When you reach the last section of the game, the platforming difficulty does ramp up quite a bit. While not highly difficult, in these last sections of the game I would say that the difficulty reaches a medium difficulty level. Some of these areas require quite a bit of precision which means that you will die several times until you figure out exactly how to perform the necessary actions in order to get past the obstacles. If you play a lot of platformers you still shouldn’t have too many issues. In addition to the platforming elements, the game introduces a fighting mechanic into the game. The fighting system in the game is pretty basic. The game has enemies of two different elements/colors. You will quickly unlock the ability to transform your character into two different forms, one corresponding to each color of enemy. In order to damage an enemy you have to hit them while in the same color/form as the enemy. As far as attacking you have a normal punch, an upward punch, a charged attack, and a slide/dodge ability. This makes the combat quick to pick up. Unfortunately it makes the game feel like a button masher since at times all you will be doing is continually hitting the punch button. As you get further in the game you will need to start getting better at sliding/dodging since you will be facing many enemies at the same time who will kill you pretty quickly if you are unable to dodge their attacks. The combat is not bad but I kind of wish the game would have added more mechanics to the combat system which would have provided for some more variety. Overall I preferred the platforming over the combat. In Red Goddess: Inner World you play as Divine. Divine is a young deity/god in trouble. Having lost all of her memories she wakes up in a strange land with no knowledge of what has happened. In order to discover her past and stop the evil that threatens the world, she must enter her own mind which appears as a strange planet that she must explore. While exploring the planet she will regain her lost abilities and memories as she prepares to rid the world of the evil that threatens it. When I first saw Red Goddess: Inner World the first thing that stood out was the visual style of the game. Not being much of an artist myself, I don’t know how to exactly explain the visual style of the game. 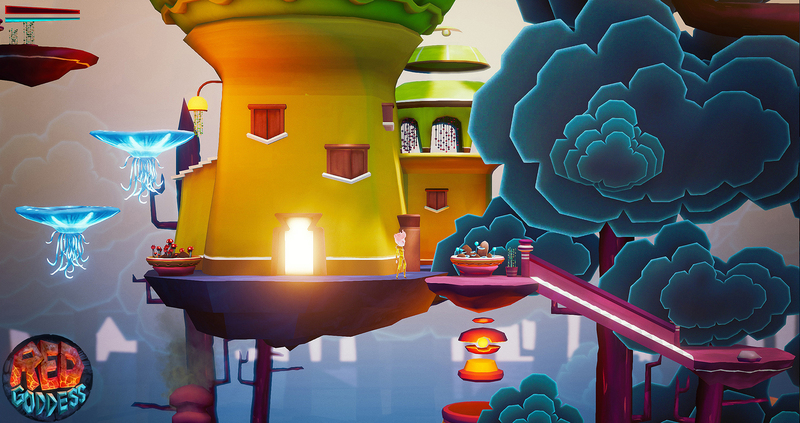 The game has a unique style that is colorful and brings the world to life. The game’s style is kind of cartoony but also has a lot of influence from fantasy settings. The graphics are fantastic and were the highlight of the game for me. In addition to the graphics, the story is interesting but a little predictable. While the story never engaged me enough that I was on the edge of my seat waiting to find out what would happen next, it was interesting enough that I wanted to see how it ended. The narration in the game is well done even though it does kind of get annoying when the same couple of phrases are repeated over and over again when you die. With how well the narration was done I kind of wish all of the dialogue was audio instead of speech bubbles. While a lot of indie games just slap a story onto some gameplay elements, the developers of Red Goddess: Inner World seemed to actually put work into the story. As far as length you can probably expect around four to six hours of gameplay. It took me a little over five hours in order to complete the game. I tried to collect all of the coins and hidden costumes that I see but did not go out of my way trying to find either. I would say that in those five hours I did most of what the game has to offer. Unfortunately I don’t see a lot of replayability in the game. Outside of playing the game for a second time, I don’t see much else you can do with the game. Since you can pretty easily get most of the unlockables and achievements there is not much else to do with the game. I ended up getting ten of the twelve achievements without really even trying and if I wanted to I could probably get the last two pretty easily. At a price of $10 a four to six hour game is not a bad deal. I think fans of Metroidvania games will get their money’s worth out of the game. People who like but don’t love these type of games should maybe wait for a sale on the game. While the load times are usually short, at times they can get frustrating. Every time you die you are sent back to the loading screen. While the loading screen probably only takes about ten seconds, it can get annoying during some of the later sections of the game where you die several times in a row as you are trying to perfectly time some of the sections. In these sections you end up running into a lot of loading times which are accompanied by the narrator regularly repeating the same phrases every single time. I think the game should have either had less coins or had more items that you would spend them on. While I tried to collect most of the coins that I encountered, I ended up purchasing all of the upgrades well before the end of the game. After purchasing all of the upgrades, there is nothing else you can use the coins on. You still want to try to collect as many coins as possible since the upgrades do help a lot in the later stages of the game and you might have some troubles if you don’t have all of the upgrades. Overall Red Goddess: Inner World is a good game. I have played better games but I still had fun with the game. The art style is fantastic and the story/game environment is interesting. The controls are easy to understand and work well. The game is kind of on the easier side though and I would have preferred a little more challenge. While I enjoyed the platforming elements of the game, I found the fighting mechanics to be only adequate. The form shifting combat is interesting but too many of the fights just seem to turn into a button masher. I had fun with Red Goddess: Inner World and I would recommend it to anyone who likes these types of games. Fans of Metroidvania games in particular should really enjoy Red Goddess: Inner World. Beautiful artwork and interesting story. Combat could have been a little more robust.